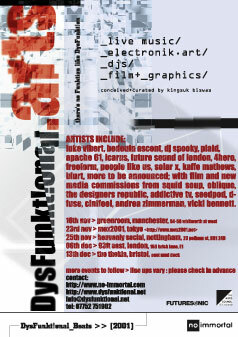 Total immersion in the digital arts in a freeform way is the ethos of the DysFunkt!onal Beats Tour which is supported by the Arts Council of England and Futuresonic. Taking it further will be a compelling selection of artists and DJ's on hand including 4Hero, Future Sound of London, Luke Vibert, People Like Us, DJ Spooky, Plaid and Bedouin Ascent, plus visual art and design throughout (D-Fuse, The Designers Republic, Addictive TV, etc). "Une soirée de musique électronique improvisée live qui transporte au-delà des frontières du conformisme. Des artistes du monde entier, aux influences variées (jazz, d'n'bass, indian classical) unis par le désir de désintellectualiser la musique electronique." - Essentially it's a platform to showcase live, improvised electronic music and visual artforms which explore more non-linear forms and structures than in regular commercial dance music (with a particular emphasis on rhythmic deconstruction, jazz and fusion sensibilities). Although experimental, these events are intended to be very accessible and above all a great party atmosphere for those not necessarily wishing to engage intellectually. It's all about the science of the 'cut-up', whether in music, visuals, design or writing for example. - This is also an opportunity to showcase 'freestyle' live sound which is not often associated with the rigid structures of electronic dance music. Musically it's about arrangements falling apart and coming back together - invoking a perpetual and dynamic condition - like a continual series of 'mistakes' with no real agenda, other than the fact that it sounds good. The freedom of chance; the opportunity for chance interaction within musical structures to build their own narrative; the chance for artists to take some risks they wouldn't normally be able to and collaborate on new work. Anything's possible. That's both the danger and the beauty! 0_] t o u r d a t e s:..
- film: Andrea Zimmerman, Oblique, Addictive TV, Marc Everett. - djs: Phil Winter (moon palace), Jim Backhaus (kosmische). - installation: Seedpod, D-fuse, Squid Soup. - film: Andrea Zimmerman, Oblique, Addictive TV, The Designers Republic, Marc Everett. dysfunktional beats in uk, italy, france, germany, spain, usa, japan.